Cake originally made for Boo in Jan 2011. When Boo turned four she asked me for a Tinkerbell cake. We sat down at the computer and I pulled up all kinds of cakes for her to look at. That was my first mistake, she liked every cake she saw. Finally she turned around and told me she wanted a big cake with Fairies and flowers. Big cakes I can do. 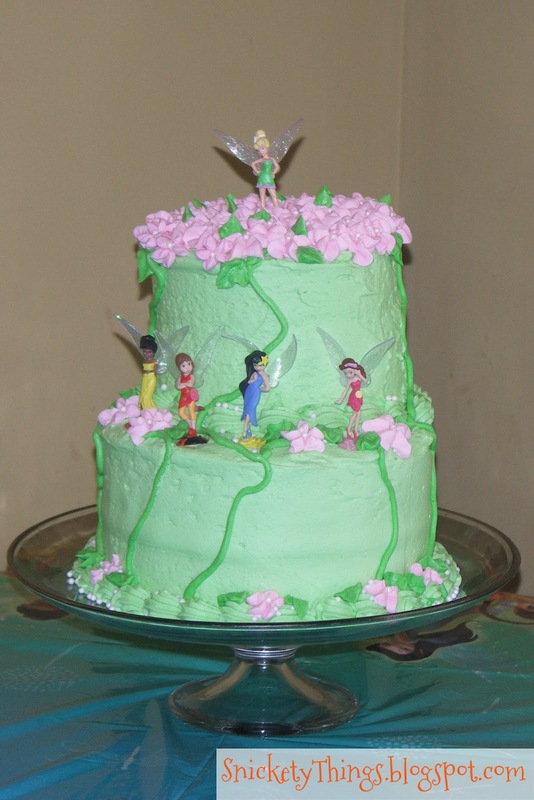 I am not artistic enough to make my own Tinkerbell out of fondant so I knew I would be using the little miniature toys for the cake. On top of that, Boo suggested I use all of the Fairies but make Tinkerbell special. I started with my eight inch and six inch round pans. I made two layers of each, all iced in a pale leaf green. I offset the six inch layers to line up the cake along the back. That gave me a larger ledge at the front . I just made a regular shell border at the bottom and middle with a Wilton star tip (I can't remember which one exactly but one of the larger ones). 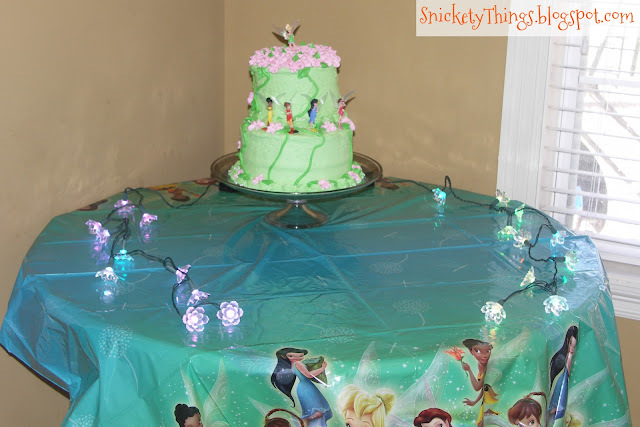 I tinted what was left of the light green icing a bit darker to make vines along the cake with a Wilton #5 tip. I just made drop flowers for the top of the cake, and spread them around the borders of the cake also. I added a few leaves with a Wilton leaf tip. Tinkerbell sits on top in her special spot while the other Fairies sit on the ledge I created. I only had enough time to grab a quick shot of the cake before the party. The floral lights on the table were a Walmart after Christmas clearance item. They were battery operated and changed colors when they were lit. It really did look magical. Boo's reaction to the cake was great. She said it was exactly what she wanted. I am glad she is so easy to please. Thank you! I will swing by your site. What a lovely cake...it looks yummy and the girls get to keep the little figurines...cool! Love the cake! I am a new follower. Please follow me back. Thanks! This is absolutely a stunning looking cake! Great work. I bet she loved it. Gorgeous! My little girl would have loved something like that. Great cake--I'm sure she did love it! Thank you! Those flowers are the easiest ones I do. You will notice them on a lot of my cakes. I am popping in from "Made With Love Link Up" That cake is precious! I bet it made your little girl very happy! Thanks! I will stop by and take a look. Sweet cake, my daughter's favorite character's to meet at our last Disney trip were the residents of Pixie Hallow. She'd love this cake! Thank you for sharing on A Crafty Soiree. Thanks! The Fairies are the best according to my daughter, too. What a wonderful cake! I love Tinkerbell! Thanks for linking up for Friday Favorites. I'm featuring you this week. Come by and grab my featured button if you'd like one! Thank you Michelle! I'll be stopping by. Thanks Natasha! I've already linked up. Thank you! I just started out taking the Wilton classes at Michael's. I love it! The flowers and the border are fabulous. Thanks so much for sharing at Whimsy Wednesdays! What did you use for the little white dots in the flowers? Your instructions are helpful & I'm hoping to make a cake that looks half as good as yours! Many thanks for sharing! Thank you so much and tell your daughter I think she has excellent taste in cakes! This cake was pretty easy to make so I bet you will be able to pull it off without any trouble. The white dots in the flowers are actually just sugar pearls. I found a bottle on clearance from Walmart just after Christmas that year, but you can get them at places selling cake decorating items (Michaels, Hobby Lobby, etc). I always hit the cake decorating section after holidays to stock up on clearance items. Sprinkles keep for a fairly decent amount of time and I always find a use for them (even if it is to just spice up the kid's lunch. If you have more questions, please ask!